Last night it was obvious that Baltimore has missed the NBA. Fans have been waiting 14 years to see basketball back in Charm City. Baltimore basketball fans showed their love for the NBA by selling out the Baltimore Arena on its 50th anniversary to watch the New York Knicks defeat the Washington Wizards 98-89 in the inaugural Baltimore Basketball Classic. The Baltimore Arena was filled with players old and new last night. Former Baltimore Bullets and New York Knicks players as well as current Baltimore Ravens Torrey Smith, Jacoby Jones and Ray Rice were in attendance to welcome the NBA back to Baltimore. But the main attraction was Baltimore native New York Knicks superstar Carmelo Anthony playing professionally in his hometown for the first time ever. Melo had 22 points, 5 rebounds, 4 assists and 1 steal. The majority of the 12,376 fans were cheering for the Knicks, rather than the Wizards. The Baltimore Arena was bathed in orange and blue (making this Denver Broncos fan very happy). One of their favorites in his first year in the NBA was Tim Hardaway Jr, son of five-time NBA All-Star Tim Hardaway. Although he did not start, Hardaway Jr was the second highest scorer with 14 points. It wasn’t all about the Knicks last night though. The Wizards Bradley Beal had 21 points and 3 rebounds while John Wall had 14 points, 8 assists and 2 rebounds. It was a great night of basketball in Baltimore clearly showing the NBA would thrive in Charm City! 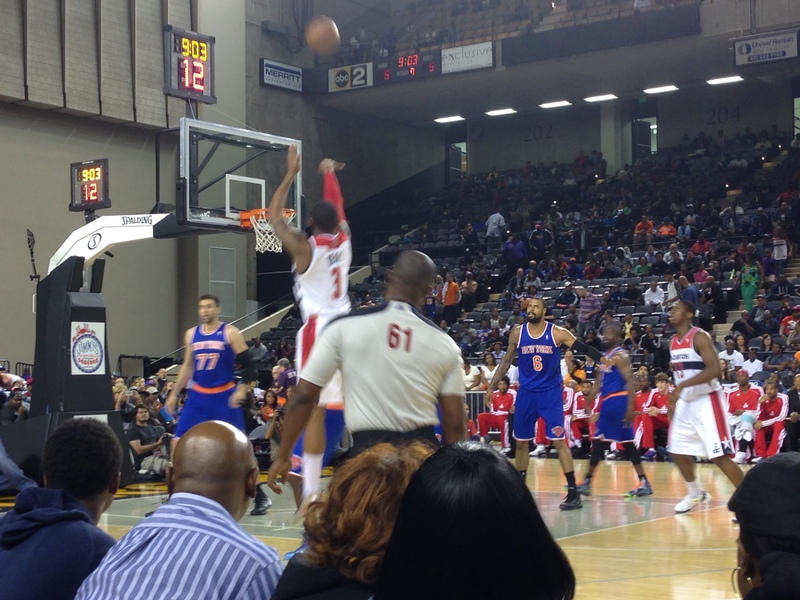 To see all my pictures from the Wizards-Knicks games last night, please click here.